The Hurricanes huffed and puffed to a total of 109 for the loss of 10 wickets and Jos Buttler was named the man of the match for his heroics. Jos Buttler chose the perfect clash to make an impact for the Sydney Thunder against the Hobart Hurricanes by smashing an awe-inspiring knock of 67 in just 41 balls after being put into bat by Hurricanes captain George Bailey. 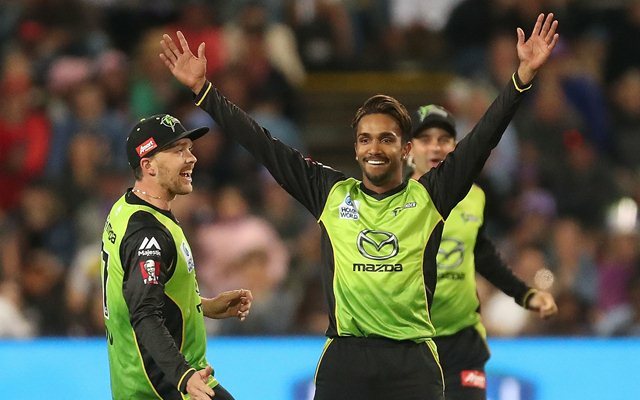 The Thunder romped off to an impressive start on the back of an aggressive start to the innings by openers Kurtis Patterson and Jos Buttler scored 24 runs in just 2.3 deliveries before Patterson meekly surrendered his prized wicket against Jofra Archer who was impressive in his BBL clash racking up figures of 1/22 in his allotted 4 overs at an exciting economy rate of 5.5. Thomas Rogers was taken to the cleaners by the Thunder batsmen as the bowler were smashed for 50 runs in just 3 overs indicating what a poor day at the office the lanky lad was forced into. Buttler smashed the Hurricanes bowlers to all parts of the ground with opposition captain George Bailey left dumbstruck at the intensity of his knock and his bowlers demotivated and befuddled following the onslaught. Captain Shane Watson and reliable middle-order batsman Callum Ferguson were the principal run-scorers for the Thunder except Buttler with the former scoring a passive 41 off 35 deliveries and latter contributing a 21-ball 24 leading them on to a score of 166/5 at the end of 20 overs. Spinners Arjun Nair and Fawad Ahmed choked any momentum and belief which the Hurricanes while attempting the chase of 167. They swooped 4 wickets against 31 runs amongst themselves. The Hurricanes enjoyed an aggressive start just like the Sydney Thunder scoring 23 runs in just 2.2 overs before Short was dismissed by impressive Kiwi pace-bowler Mitchell McClenaghan with a delivery which left the batsman confused and forced him to play a loose shot. Ben Mcdermott, captain Bailey and experienced wicketkeeper Matthew Wade could not cumulatively contribute 10 runs to the total, which indicated the dominance of the young spin duo. McClenaghan was quite impressive during his spell with figures of 2/19 indicating why he is such a coveted player in the T20 format around the world. The Hurricanes huffed and puffed to a total of 109 for the loss of 10 wickets and Jos Buttler was named the man of the match for his heroics. BBL 2018-19, Match 22, Adelaide Strikers vs Sydney Sixers, Match Prediction: Who will win the Match?